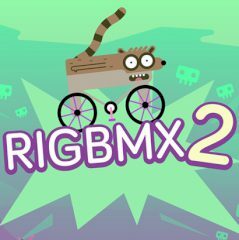 The heroes of the Regular Show are having fun riding the bike. Are you ready to lead them through the chain of traps and trampolines? Get ready to meet your favorite heroes again in such incredible game! Ride a bike and jump over the trampolines, avoiding getting into troubles and gaps with lava. This is all you need to know about the game! Reach the finish and earn maximum points!